New Event – Treat Us Like Adults Rally! We have added an Events Calendar to the Grow up Australia site to allow people to keep track of any activities they may wish to participate in. Anyone who is planing an event or knows about one please email events@growupaustralia.com with the appropriate details including a short description, event URL and event dates. 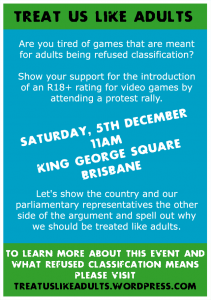 The latest event added to the calendar is the Treat Us Like Adults Rally in Brisbane planned for the 5th of December. The Treat Us Like Adults Rally is being organised by Ethan Watson a game programmer. Ethan hopes the rally will reach gamers who don’t engage with the online gaming community. Interestingly Ethan also supports the introduction of an X18+ rating for games to deal with games that only contain sexually explicit content. Films rated X18+ in Australia are only legally available in the ACT or Northern Territory. In addition to the Event Calendar we have also added a number of Grow up Australia badges that people can add to their blog or website. Don’t forget to link the badge to our site!